A DigitalPoint Forums member reports that the Yahoo! 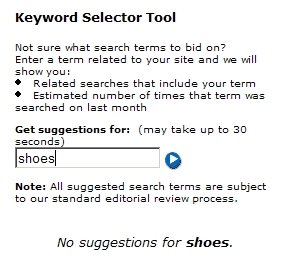 Overture Keyword Tool is no longer providing results. I reproduced this as illustrated below. It looks like the Overture tool is finally gone unless this is a bug. YahooSarah said in January that Overture would be offline until an updated product was released. Does this mean the product is ready? After all, in May, Yahoo stopped updating the Overture tool. It has been four months so hopefully a new tool will be announced shortly. Since so many tools use the Overture API, I certainly hope that this is the case. DigitalPoint Forums members agree.